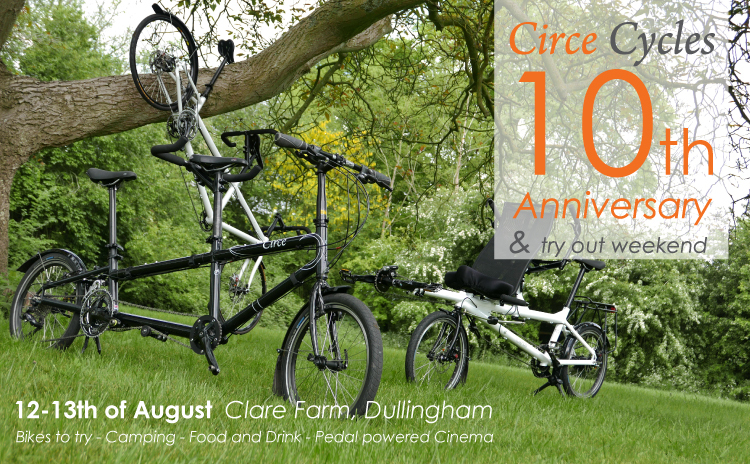 It amazed us to realise that it’s 10 years since we introduced the Circe Helios, so we thought it appropriate to mark that milestone with a celebration to which all our customers and any interested parties are invited. An outdoor event seemed appropriate and we were fortunate to get access to some peaceful, secluded fields in the pretty village of Dullingham. The lush meadow is perfect for pitching a tent and there are basic facilities sufficient for all needs. There is also a grassed area suitable for smaller motor homes. For those preferring more ‘luxurious’ facilities, nearby towns, Newmarket and Cambridge, offer various accommodation options and more lavishly equipped camping. Let us know if you need any help with the latter. 1600 to 1800 – Local family paced ride. 1800 onwards – Food and drink. 1430 – Reassemble, and family paced ride back to Dullingham base. 1600 – Break camp and have site cleared by 1730. * We’re planning on a self catered picnic at Fassage Hall, but for those wanting to sit down to ready prepared food, there is the very nearby National Trust property, Anglesey Abbey, which is well worth a visit or, in Lode, the Shed Pub. Although It is a weekend event, anyone not able to partake of the whole weekend is very welcome to drop in and join us at any stage. Do note that we will need to restrict numbers for camping and food, so ask that you book for these.